A question faced by companies today – how do we provide color to the services we provide, show how our products or services enhance a lifestyle, and elevate the expertise of our team? 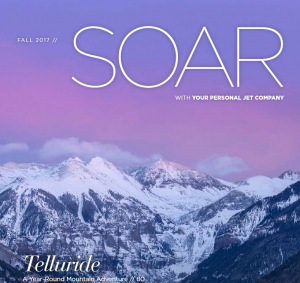 For Jet Linx, the answer is SOAR magazine, our flagship company publication, published quarterly to inspire, inform, educate and entertain our readers across multiple audiences. The magazine establishes members of our team as experts in private aviation, defines our brand and points of service, provides a closer, more personal look at our company, community involvement and culture, and aligns us with other well known, respected luxury brands.